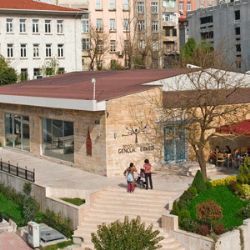 The Youth Center of the Beyoglu Municipality moved to the new places in Şişhane Square March 2011. The center works with young people between 15-30 ages in Beyoglu District to support their cultural, artistic and social sides. One option is to design a bank-sitting desk around the tree which has a very good view of Haliç and Şişhane Square outside of the center. The other option is to design lighting lobby-entrance hall of the center. The other option is to design planters for the open amphitheater.